The goals for a Marine Gunnery Sergeant change over the course of a career. Yes, you do your job, but the military can always ask you to do more, to be more, and to lead in word and deed. Russell Garcia overcame a heart condition to earn his stripes. He served two tours in Iraq and saw the world. But something was still missing. This year, Russell and his wife Kat decided to ratchet up their fitness regimens. He has already taken the stage, and she will soon. The next step, he says, is to get a victory, a pro card, and further build a promising future in fitness. But wherever his fitness career takes him, Garcia will always be a Marine. I knew since I was young that I wanted to go in to the military. I didn&apos;t really have something or someone that inspired me. I just knew after seeing these guys on television shows, news, and pictures that I wanted to be part of that. I joined the Marine Corps right out of high school. I did four years, and after my first enlistment I got out and went back to civilian life for about a year. During this time, because of the economy in 2002 and the fact that I really missed being in, I decided to talk to a recruiter and reenlist back into the Marine Corps. As I have been around the Marine Corps longer, I see that I&apos;m getting older and I have to keep up with the younger guys. Plus, I see the guys my age tend to do what they have to physically and nothing more. Right now things are getting more and more competitive for reenlistment and promotion, so you have to step up your game and stand out in a positive way to excel. For me it&apos;s just motivating because I like to push myself. The fact that I can still get a high score or beat some of the younger guys is a huge confidence boost. I can still keep up and not give into the whole "Well, I&apos;m getting older, so I might as well settle" mindset. I can&apos;t stand hearing people say they are too old, too big, too skinny, or any other excuses people use in order to not live a healthier lifestyle. "For me it&apos;s just motivating because I like to push myself." Have you ever had a stretch where your body failed you? I don&apos;t know if I would say my body has failed me. I&apos;ve always loved pushing myself when it comes to my physical fitness. I&apos;m good at documenting the weights I lift so the following week I can try to push past that. I guess the only time I could say my body has given up on me was in 1998, my senior year of high school. I was in the middle of a wrestling match and had chest pains and couldn&apos;t breathe. Honestly I thought I was having a heart attack. I found out that I have a heart problem. I went to a heart specialist and had to undergo many test. At first I was very beat down. I just kept asking myself, "How could this happen to me? I&apos;m only 18!" I received letters in the mail saying that I couldn&apos;t join the military, which crushed me psychologically. I told myself I couldn&apos;t give up and push myself to show them I could still join, and that I wouldn&apos;t let this stop me. Now I stay in shape, and the doctors have told me I&apos;m fine and shouldn&apos;t have an issue again as long as I continue a healthy lifestyle. 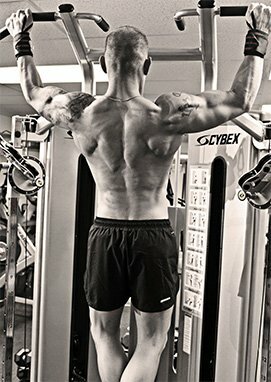 How did you get started in men&apos;s physique? I&apos;ve been lifting since high school, but I had no clue what I was doing. I also lifted throughout my time in the Marine Corps, and I started learning more on lifting around 2006. But I still didn&apos;t understand that you really had to keep your diet clean. While overseas in Okinawa I met my wife, Kat. We both enjoyed fitness, but we were just going off of what we picked up from experiences and from other people. This year, we set our sights on competing. 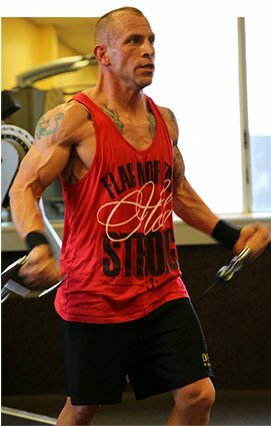 In February of this year we decided to get a trainer and found Steve Poynter, from fitnesspoynters.com, and signed up for 12-week plans. I started at 195 pounds, and by the end of the 12 weeks I was down to 170 pounds. After talking it over with Steve, I decided to start a contest preparation and get ready for my first men&apos;s physique competition. My wife is also currently training for her first figure show. This is a sample week. 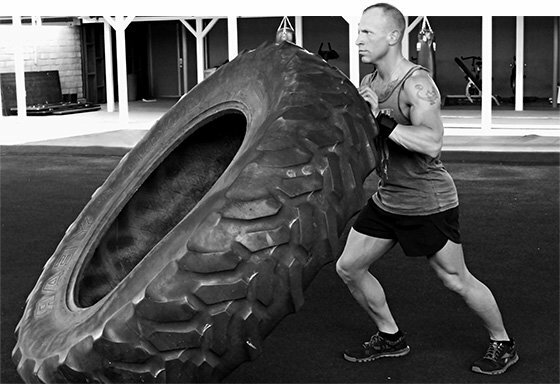 Every two weeks my trainer would completely change my workouts. "I told myself I couldn&apos;t give up. I wouldn&apos;t let this stop me." This was just for 2 weeks. After every 2 weeks my trainer would completely change my meal plans. Due to being in the military, sometimes I can&apos;t make it to my meal. So I always carry Quest Bars on me as well. I&apos;m a huge fan of their chocolate brownie, peanut butter supreme, and chocolate peanut butter bars. What did you learn about yourself at your first NPC show? It was amazing! Six months ago, when my wife and I were just talking about trying to get more into the fitness industry, I felt like it was never going to get here. It was like a farfetched dream. After completing the contest preparation and getting up on stage I felt like I have never felt before. We shared pictures with our friends, family, and fitness team, Team Poynter. Even though I didn&apos;t place in the top five, I received so much encouragement. My transformation, and the fact that I actually stepped on stage, moved so many people. It was the first time I actually felt like I inspired people. I have had so many people tell me that watching my wife and I transform and get on stage really motivated them to get in shape. I would take that over a trophy anytime. Honestly, I didn&apos;t know how I would do on stage. I mean, we all want to place, I&apos;m not going to lie about that, but I wasn&apos;t upset at all. I took seventh and eighth in my two classes out of 12. For competing the first time I think that was pretty good. It would mean so much. Right now my short-term goal is to be in first callouts, but my long-term goal is to earn my pro card. I feel what keeps us going is once you hit one goal, you have to make another one. I would actually like to compete at a pro level. After getting to meet a few pros I think it would be amazing to share the stage with those guys. "Once you hit one goal, you have to make another one." Who are your favorite physique competitors? When I first started looking into this sport I came across Mark Anthony Wingson and have always enjoyed watching his progression. After doing a fitness retreat with Kat, I had the pleasure of meeting Alex Carneiro, Trevor Larsen, and Antoine Scott who took the time to really help me right before my first show. Their eagerness to share their knowledge and experience made a huge impression on me. This is the kind of example I want to be able to show and share with other people when I reach their level. I always want to remain humble and share my knowledge with others even if their goal is not to be a competitor. I know being in the military our schedules can be tough, and you never know if you will be at a field operation or deployed, but don&apos;t let that stand in your way if this is what you want to do. Being in the military is stressful and demanding. I&apos;m lucky to have a wife who supports me. I recommend finding other people who share this passion. Create your own support network. If you want this then you will do it. Only you can give up on yourself!